NEW YORK (AP) — The father of a top-rated college basketball prospect testified Thursday that his son was offered thousands of dollars on the sly to play at major programs before a corruption scandal derailed the promising player’s collegiate career. 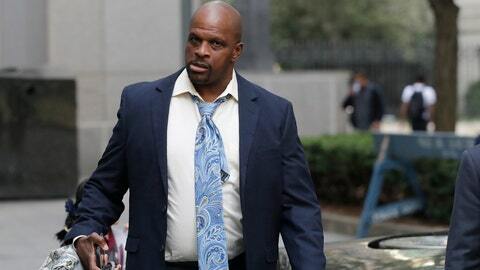 At a federal trial over allegations about dirty money in college hoops, Brian Bowen Sr. said that an aspiring agent, Christian Dawkins, told the father he could pocket $50,000 if his son played at the University of Arizona, $150,000 at Oklahoma State or $100,000 at Creighton. Bowen said there was some interest from Oregon but didn’t recall a cash offer. Bowen told a Manhattan jury it was his understanding the offers were being made by assistant coaches at the schools, though he never spoke to them directly about money. He said the Oklahoma State offer, which included an additional $8,000 for a car, came from then-assistant coach Lamont Evans, a defendant in the investigation who’s pleaded not guilty. Gatto’s attorney and a taped conversation in evidence at the trial have suggested the deal to sign with Louisville had to compete with an undisclosed offer to lure Brian Bowen Jr. to Oregon, which is sponsored by Nike. Oregon has denied it knew of any deal. “Is Tugs in college?” asked Assistant U.S. Attorney Edward Diskant. This story corrects spelling of Merl Code’s first name.